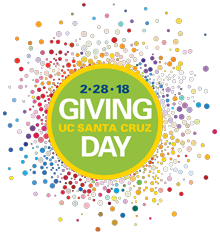 On February 28, 2018 UC Santa Cruz will host the third annual Giving Day campaign, a 24-hour online fundraising event. Incentives to give include matching funds: if you are interested in matching funds for specific projects, please email cmasseng@ucsc.edu. Challenges throughout the day will reward teams attracting the greatest number of donors during specific times. The minimum amount to donate online is $5. Campus events including accepting cash donations, of any amount, on day-of are planned for Quarry Plaza. Stay tuned for the daily schedule! Follow Sociology@UCSantaCruz on Twitter or Facebook and help spread the word about all of our projects using the hashtag #give2UCSC on social media. Visit our Giving Day project page to make gifts or track our donations in real time! Training the next generation of science and justice researchers to maximize the public good of science and technology. Students learn collaborative methods and knowledge sharing strategies for creating science and justice together. The Science and Justice Training Program (SJTP) is training a next generation of social scientists, humanists, engineers, physical and biological scientists, and artists who can collaborate and respond to the complex and core concerns of our times. Help grow our ability to make a difference in these crucial issues that lie at the intersection of science, the environment, health and justice. Posted in News and tagged fundraising.